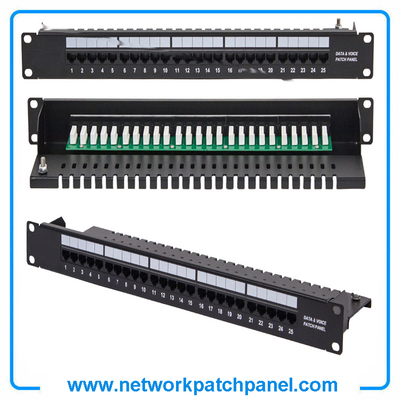 • CAT 3 UTP 50-port patch panel. • Available with T568A/B wiring pattern and meeting the requirement of CAT 3 standard. • Design to mount to any standard 19" rack or cabinet. • Meet or exceed the requirement of ANSI/TIA/EIA 568B.2. • IDC contact material: phosphor bronze with tin/silver/gold plating over nickel. • Contact material: phosphor bronze with 6 to 50 U" gold plating over nickel. • Panel frame: Black or Ivory electrostatic powder-coated steel. • Fitting for 22/24/26 AWG solid wires. • Inserting duration: ≥ 750 times. • Punching duration: ≥ 250 times. • Dielectric withstand voltage: 1000V AC RMS, 60Hz 1min. • Housing material: ABS or PC, UL94-V0 or UL94-V2.